Our Samurai is easier to use and can go places few other walk behind rotary brush cutters can. The Samurai has operator-friendly features , such as adjustable handlebar and adjustable blade height. With the hydrostatic drive transmission and front wheel, you can operate the Samurai with ease. 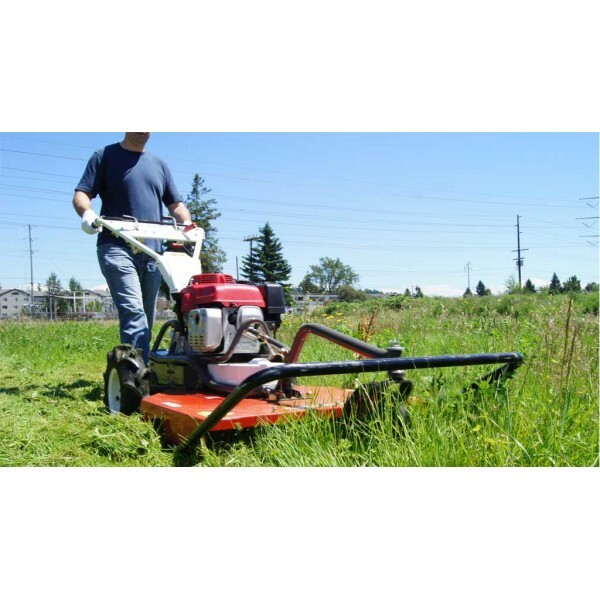 Mowing over rough, uneven terrain can be tough job, but not when you have the Samurai. With the front wheel, you can turn without lifting the mower deck, saving you time and effort. With a few turn of a crank, you can set the blade to the heigh that works best for your cutting conditions. This will not only give you the best possible cut, but it will help you to avoid objects such as rocks and stumps. The Samurai’s locking differential feature gives you the option of having both wheels move in tandem, giving you added trac-tion when working on slopes or on rough ground. TRACK DRIVEOur advanced track system gives you great traction and the ability to make tight turns u..
Hauling firewood over rough terrain? Moving materials up and down stairs? Transporting gravel to bu.. The GradenQuake is the fast, easy and effort-free way to till your garden. Its compact design make..